If you are an avid motorcycle rider, a pair of the best cruiser boots can make a daylong ride safer, more comfortable and enjoyable altogether. This is because so many threats await your ankles and feet every time you ride a bike. You, however, need to consider a number of factors including the size, material, comfort, performance, and safety of the boot before settling for any pair. 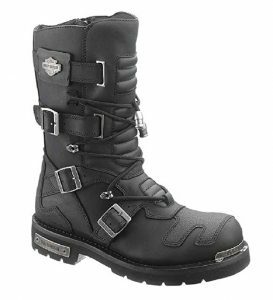 In this article, we review top 6 best cruiser motorcycle boots on the market to help you make an informed purchase decision. Featuring a Drystar waterproof membrane, this boot is designed to help you enjoy cruising in both wet and dry conditions. But what’s Drystar membrane all about? You might want to ask. Well, this special membrane is designed to keep water from penetrating your shoe whilst allowing moisture to get out. You see, this is a unique technology that keeps your feet dry, airy and sweat-free thereby making all your cruise motorcycle rides nice and easy. In addition to all that, this boot is equipped with an anatomical EVA footbed (that can easily be replaced) along with a breathable Lycra lining on top for superior comfort. Construction (build-quality) is yet another area where this amazing boot excels. Its upper surface is made of full grain leather to provide you with the ultimate protection for your feet in case of a crash while also ensuring long-lasting performance. Its outsole, on the other hand, is crafted from vulcanized rubber to give you a better grip on the bike pegs and on any terrain. What’s more? The boot spots a PU midsole designed to provide support, extra protection while minimizing on overall boot weight. As if that’s not enough, this Drystar boot comes with a reinforced heel counter and toe box both offering impact resistance and optimal support. 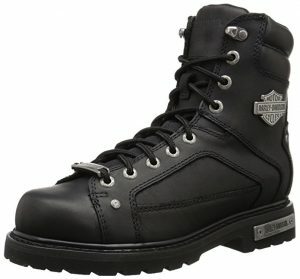 Harley-Davidson is a renowned manufacturer in the motorcycle equipment industry reputed for producing top quality cruiser boots. This particular pair of boot excels in terms of durability, security, style, and comfort. Its upper is made of 100% full-grain leather which is further reinforced by Goodyear welted construction – thereby guaranteeing long-lasting value. Additionally, the boot comes with a quilted and padded collar which is designed to offer optimal comfort and shock absorbing performance. Further, this pair of kicks is outfitted with a full-length and cushioned sock lining to provide you with the highest level of comfort. The lining also has mesh to ensure your feet stay dry by wicking away moisture while providing you with additional impact protection. Also, the Abercorn boot is made with a durable YKK locking inside zipper and speed hook system designed to allow a comfortable and snug fit. Besides, the zipper makes putting on the shoes and taking them off effortless. Last but not least, it boasts a tough outsole made of quality rubber for sure-footed grip. Moreover, the outsole is slip, abrasion, and oil resistant for additional safety in each step you make. If you are on a budget and looking for quality boots that can provide you with the protection you need, the Highway 21 Spark boots are an excellent choice. Equipped with a cushioned sock lining and a removable insole, the shoes are quite breathable and comfortable to wear for long periods. In addition to this, they feature a HiPora lining throughout with great waterproofing properties to keep your feet dry. What’s more? As far as durability of the boots is concerned, the upper is made of 100% oiled full-grain leather that is water resistant to protect your feet against cold weather and rainwater. On top of that, it boasts Goodyear-welt construction for enhanced durability and protection. Thanks to their pull loop and profile design, they are very easy to wear and take off as needed while retaining a classic look. But here is the best part. 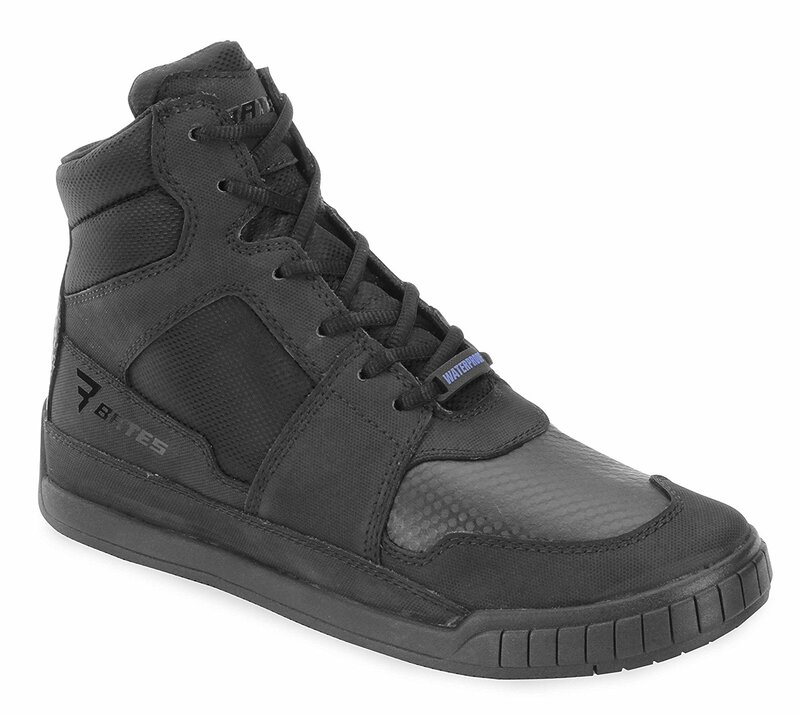 The footwear includes a rubber outsole that is both oil resistant and anti-slip. Additionally, the sole is quite durable and capable of grasping the foot pegs tightly. And for your peace of mind, the boots are backed by a 12-month manufacturer’s warranty. For style-conscious motorcycle riders, the Bates Marauder boots boast a unique and aggressive urban style while still incorporating tons of protective features. Thanks to their pororn XRD impact foam on the side, you won’t have to fret about your ankles getting injured if you wear these beauties. Additionally, the shoes are supplied with a leather toe protection featuring abrasion resistant properties to guard your toes against impact. With a waterproof membrane, you can ride in the wettest conditions in these boots and your feet will stay dry all day. Moreover, they come with a slip and oil resistant outsole constructed from premium rubber for enhanced durability. The outsole also makes it easy to grip your bike pegs. As far as the uppers are concerned, the boot spots a combination of high-performance leather and nylon materials that make it more durable. For extra protection, Bates Marauder comes with an internal midsole to provide you with additional comfort and shock absorbing performance. 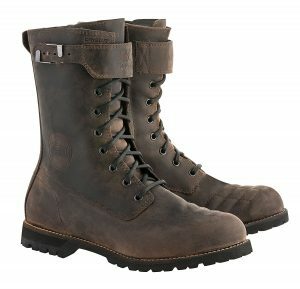 Featuring a top grain leather upper, the boots are designed to be extremely durable, strong and moisture-resistant. In addition, they also offer a high level of protection from impact. Their high design, on the other hand, ensures excellent weather protection including water, debris, and dirt. Moreover, the boots are supplied with a soft outsole thereby ensuring better grip on the pegs and maximum off-the-bike comfort. What’s more? The outsole is mated to the upper using Goodyear welt construction for extra durability. As far as protection is concerned, the Icon 1000 Elsinore is packed with padded ankle protectors inside to guard your most vulnerable joints. On top of that, the boots incorporate a metal heel plate, leather shifter panel and molded leather shin plate to provide you with the necessary protection against impact and debris. 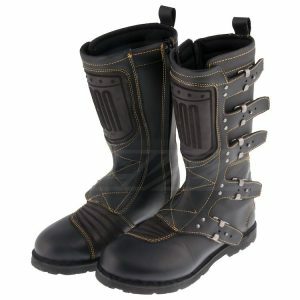 Last but not least, the footwear is outfitted with YKK zippers and cast metal buckles that make it easy to put them on. 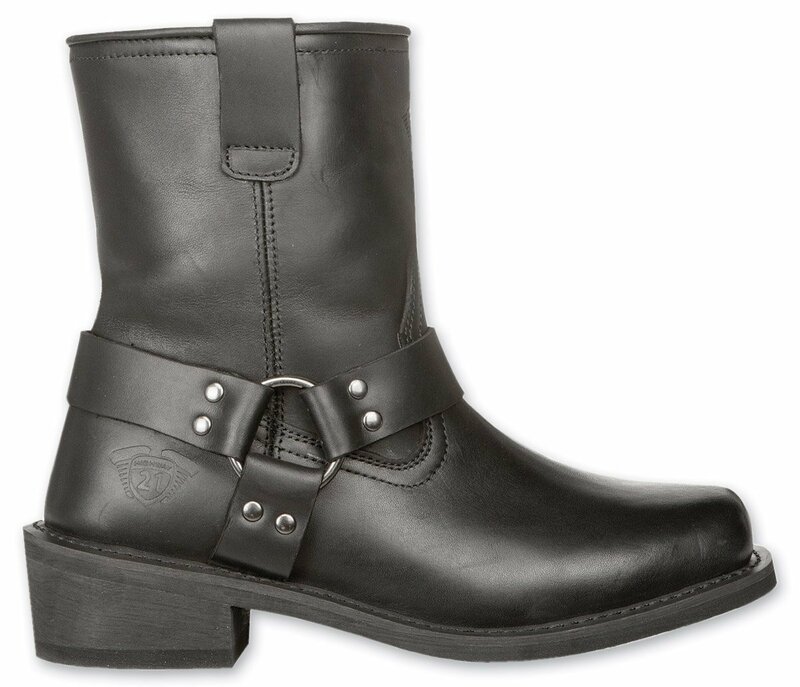 The buckles also ensure you achieve a personalized fit. Further, the soles feature a steel shank to give you superior stability and support. With a full-length interior soft mesh lining that helps keep your feet dry and cool both on and off the road, no doubt that these boots are designed with comfort in mind. Similarly, the footwear incorporates a non-removable insole featuring mesh-lined foam to provide you with optimal cushioning and impact protection. On top of that, the boots are outfitted with a durable and oil-resistant rubber outsole for increased grip and sure footing. When it comes to the overall construction of the shoes, the upper is crafted from heavy-duty full-grain leather with TecTuff overlays that are abrasion resistant. Further, the sole boasts Goodyear welt construction to ensure the boots last for a very long time. Engraved logo plates on the side, heel, and toe, on the other hand, add a unique style to the classic look of the boot. Equipped with YKK inside zipper, three adjustable straps alongside durable buckles, the boots are easy to put on and take off. In addition to this, it is easy to achieve a customized fit by simply adjusting the straps. Different cruise motorcycle boots offer different results when put to the test. For instance, there are those that are designed to be more durable and comfortable than others. Likewise, there are those that offer better foot protection against impact and changing weather than others. Nonetheless, the best cruise bike boots are ones designed to provide you with a combination of safety and comfort features. So, make a wise choice today and be sure to enjoy the ultimate motorcycling experience the next time you’re cruising down the highways and across rugged terrains.